Video summary of review paper "Clinical efficacy and safety of anticholinergic therapies in pediatric patients". Abstract: The burden of uncontrolled asthma in children and adolescents is high. Treatment options for pediatric patients (aged under 18 years) with asthma are largely influenced by the Global Initiative for Asthma recommendations. Algorithms for adolescents (12–18 years) and adults are identical, but recommendations for children aged under 6 years and 6–11 years differ. Although the goals of treatment for pediatric patients with asthma are similar to those for adults, relatively few new therapies have been approved for this patient population within the last decade. Designing clinical trials involving children presents several challenges, notably that children are often less able to perform lung function tests, and traditional endpoints used in clinical trials with adults, such as forced expiratory volume in 1 second, asthma exacerbations and questionnaires, have limitations associated with their use in children. There are also ethical considerations related to the performance of longer placebo-controlled exacerbation trials. This review considers additional clinical endpoints to those traditionally reported, including forced expiratory flow at 25%–75% of forced vital capacity, which may help shed light on which treatments are most effective for use in pediatric patients with asthma. The pros and cons of specific and potentially clinically relevant endpoints are considered, along with device considerations and patient preferences that may enhance adherence and quality of life. Recent advances in the management of children and adolescents, including the US Food and Drug Administration and European Medicines Agency approval of tiotropium in patients with asthma aged 6 years and over, are also discussed. Alarmingly, it is estimated that asthma control is inadequate in more than half of pediatric patients with asthma despite currently available treatment and guidelines.9,13 Clearly, there is a pressing need to alleviate the burden of uncontrolled asthma in pediatric patients, and effective treatment is paramount to achieving this. As will be discussed, treatment recommendations outlined by the Global Initiative for Asthma (GINA) consist of an inhaled corticosteroid (ICS) backbone with or without additional reliever therapy.13 Evidence has recently emerged supporting the use of anticholinergics in asthma,14 and tiotropium has become the first long-acting muscarinic receptor antagonist (LAMA) to be approved for the treatment of asthma.15 The aim of this review is to report on the use of anticholinergic therapies in pediatric patients with asthma and to discuss the difficulties in investigating new therapies for this population. Algorithms for treatment of adult and adolescent (12–18 years) patients with asthma are the same (Figure 1A). For adolescents, the current GINA recommendations are low-dose ICS treatment followed by a stepwise increase in ICS dose and/or additional (or a second class of) maintenance therapy, such as a long-acting β2-agonist (LABA) or leukotriene receptor antagonist (LTRA), if control has not been achieved. Add-on treatment (eg, with tiotropium) is then suggested if control is still not attained. There are key differences in the recommendations for children. In children aged 6–11 years, increasing the ICS dose is preferred over combination ICS/LABA. If this is ineffective, then it is suggested that the child be referred for expert assessment and advice. In children under 6 years of age, the preferred asthma control medication is low-dose ICS, such as 200 μg budesonide or equivalent (Figure 1B). Due to lack of data, treatment options are limited in children under 6 years of age whose asthma symptoms are poorly controlled with ICS monotherapy.13 Therefore, data for additional second-line controller medications, such as theophylline, oral corticosteroids and anticholinergics, are particularly valuable to this patient subset. 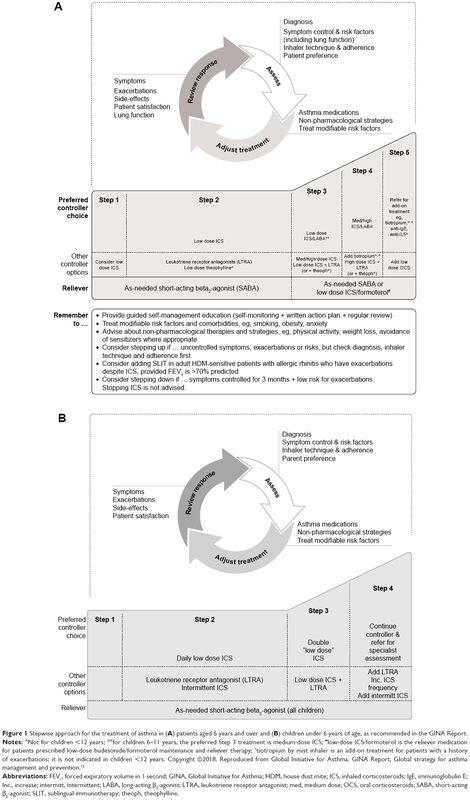 Figure 1 Stepwise approach for the treatment of asthma in (A) patients aged 6 years and over and (B) children under 6 years of age, as recommended in the GINA Report. Abbreviations: FEV1, forced expiratory volume in 1 second; GINA, Global Initiative for Asthma; HDM, house dust mite; ICS, inhaled corticosteroids; IgE, immunoglobulin E; Inc., increase; intermitt, intermittent; LABA, long-acting β2-agonist; LTRA, leukotriene receptor antagonist; med, medium dose; OCS, oral corticosteroids; SABA, short-acting β2-agonist; SLIT, sublingual immunotherapy; theoph, theophylline. While the GINA Report and its recommendations are regularly updated (most recently in 2018), there have been no updated recommendations from the National Heart, Lung and Blood Institute on asthma diagnosis/management since 2007. Anticholinergic agents target the function of acetylcholine, a neurotransmitter that plays a key role in the pathophysiology of asthma by way of driving bronchial smooth muscle contraction, mucus secretion, vasodilation and increasing airway tone. Further, cholinergic activity is believed to be the predominant driver of bronchoconstriction.14,17 There are two categories of acetylcholine receptors: nicotinic and muscarinic. Of these, the muscarinic M1, M2 and M3 subtypes are believed to be primarily involved in regulating bronchoconstriction.14 Better understanding of muscarinic receptor agonists over the past two decades has led to investigation of both short- and long-acting anticholinergics in asthma. Several studies in children with severe asthma exacerbations suggest that the addition of the short-acting anticholinergic agent ipratropium to a β2-agonist may reduce hospital admissions and improve lung function.18–21 A 2012 meta-analysis of short-acting anticholinergics as bronchodilators in children aged ≥2 years with acute asthma exacerbations suggested that short-acting anticholinergics were less efficacious than β2-agonists.22 However, the safety of anticholinergics in children, combined with the lack of additional controller medications licensed for this population, has sustained an interest in developing anticholinergics for use in this patient population. Note: aFEV1 values are mean (CI) mL. Abbreviations: AE, adverse event; CI, confidence interval; FEV1, forced expiratory volume in 1 second; HR, hazard ratio; ICS, inhaled corticosteroids; NS, not significant; PACD, pediatric asthma caregiver diary. Allergic asthma is the most common asthma phenotype.46 In childhood, asthma is frequently associated with atopy, a condition that predisposes individuals to develop immunoglobulin E (IgE) against specific allergens.47 Studies have been performed to investigate whether baseline IgE levels or blood eosinophil counts can influence response to tiotropium add-on therapy in patients aged 6–17 years with asthma. Data were pooled from moderate symptomatic patients in the CanoTinA-asthma®38 and RubaTinA-asthma®37 trials and from severe symptomatic patients in the VivaTinA-asthma®39 and PensieTinA-asthma®41 trials.36,48,49 In these pooled studies, tiotropium improved lung function irrespective of baseline IgE levels and blood eosinophil counts. Overall, these data demonstrate that tiotropium is effective in children and adolescents without the need for phenotyping of allergic status according to IgE levels and blood eosinophil counts. 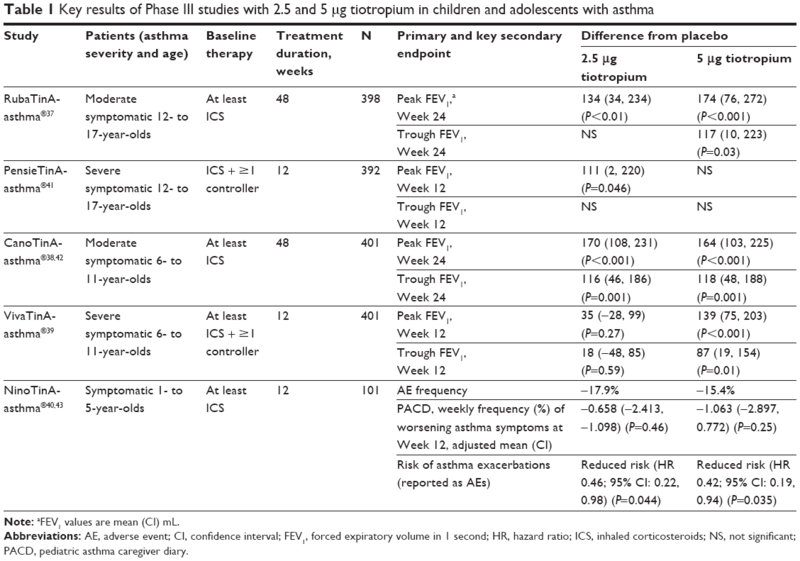 Tiotropium pharmacokinetic data from patients with asthma of different ages were summarized in a clinical pharmacology review carried out by the US Food and Drug Administration (Table 2).54 In agreements with the aforementioned analyses, exposure of tiotropium in urine and plasma samples from patients with asthma is comparable in children aged 6–11 years, adolescents and adults. Abbreviations: C0.083,ss, tiotropium plasma concentration at 5 minutes post-dose at steady state; CV, coefficient of variation; Fe0–3,ss, urine excretion fraction of unchanged tiotropium within 3 hours post-dose at steady state; Fe0–24,ss, urine excretion fraction of unchanged tiotropium within 24 hours post-dose at steady state; NA, not applicable. Pharmacogenomics is another factor that may impact response to therapy. In this respect, a study performed in adults with severe asthma found that the presence of Arg16Gly in ADRB2 may predict response to tiotropium.56 However, similar studies are yet to be performed in children and adolescents. 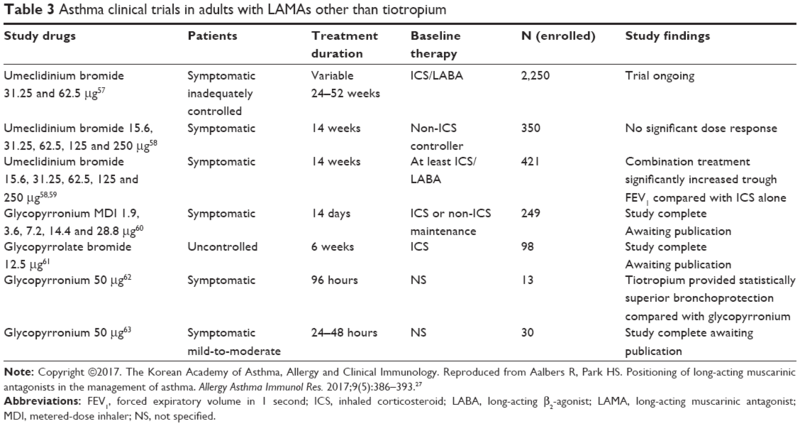 Of the clinical trials assessing the safety and efficacy of LAMAs in the treatment of asthma, the tiotropium program has thus far been the most advanced across all age groups.27 A number of studies evaluating the potential of umeclidinium bromide and glycopyrronium in adult asthma have been completed or are ongoing (Table 3), although neither agent is approved for the treatment of asthma.27,57–63 Aside from tiotropium, other LAMAs are yet to be studied in children or adolescents with asthma. These pediatric trials are unlikely to be conducted unless their efficacy and safety are first demonstrated in adults. At the time of this publication, no studies are known to be completed or ongoing with aclidinium bromide in asthma. Abbreviations: FEV1, forced expiratory volume in 1 second; ICS, inhaled corticosteroid; LABA, long-acting β2-agonist; LAMA, long-acting muscarinic antagonist; MDI, metered-dose inhaler; NS, not specified. Umeclidinium is a potent anticholinergic that demonstrates slow functional reversibility at the human M3 muscarinic receptor compared with the M2 receptor.64 Once-daily umeclidinium bromide combined with fluticasone furoate, administered via a dual-strip dry powder inhaler (DPI), has been investigated in adults with asthma who were symptomatic despite maintenance ICS treatment. This study reported significant increases in trough FEV1 in response to combination treatment, but not with fluticasone furoate alone.59 Furthermore, umeclidinium monotherapy (delivered via DPI) in patients with asthma not requiring ICS treatment did not provide a therapeutic benefit, given that it conferred modest, inconsistent, dose-independent improvements in trough FEV1.65 Other ongoing and completed studies in adult patients are summarized in Table 3. As with tiotropium, glycopyrronium is an anticholinergic with higher selectivity for M3 receptors than for M2 receptors, and dissociates more slowly from the M3 receptors than from the M2 receptors.66 The only study of glycopyrronium to be published thus far compared the effects of glycopyrronium (administered via Breezhaler) and tiotropium (administered via Respimat®) on methacholine-induced bronchoconstriction in adults with symptomatic asthma. Here, tiotropium provided statistically superior bronchoprotection at both 24 and 72 hours compared with glycopyrronium.62 An additional study of glycopyrronium in adults has been completed and results are awaited (Table 3). Several challenges are posed by the design of clinical trials in asthma involving children as participants, particularly the choice of endpoints to measure clinical efficacy. The endpoints traditionally used to measure drug efficacy in clinical trials of asthma in adults may not be the most appropriate for use with pediatric patients. These challenges need to be carefully considered in future trials in pediatric patients with asthma. It is widely recognized that clinical research in asthma lacks standardization in outcomes.67 To address this, an Asthma Outcomes workshop was convened with the specific purpose of stratifying core, supplemental and emerging asthma outcomes.67 Importantly, this workshop differentiated between recommended endpoints in adult and pediatric patients. As will be discussed, measures of asthma outcomes frequently used in adult patients are often less appropriate for use in pediatric patients. Alternative endpoints to those traditionally reported in clinical trials may help to shed light on which treatments are most effective in children. More details on these traditional and alternative endpoints are provided in the following text and in Table 4. There is a keen interest in the use of alternative acceptable measures of lung function in children who cannot perform spirometry, such as impulse oscillometry (IOS). IOS is a type of airway mechanic measurement performed by non-invasively superimposing pressure fluctuations on the airway during spontaneous breathing of the subject.87 A comparison of IOS and spirometry as measures of pediatric asthma control found that IOS complemented information gained by FEV1. Furthermore, IOS offered some additional insights into alterations in airway mechanics in response to therapy.88 However, there are cost considerations associated with IOS due to the high cost of the machines. Patient satisfaction was a priority in the development of the inhaler used to administer tiotropium in pediatric clinical trials (Respimat® Soft Mist™ Inhaler, Boehringer Ingelheim Pharma). This pocket-sized inhaler has been shown to reproducibly deliver a single-breath, metered dose of inhalable aerosol from an aqueous drug solution in an environmentally friendly manner.92 Optimization of delivery to the lungs and minimal inspiratory effort were key in the design of this device,93 and likely explain why patients favored this inhaler over the commonly used Turbuhaler® (AstraZeneca UK Ltd, Luton, UK) DPI in a clinical trial. The two devices were compared in a randomized, placebo-controlled study, which found that 74% of patients preferred Respimat® compared with 17% who preferred Turbuhaler® and 9% who had no preference.94 Among pediatric patients with asthma, the benefits and ease of use of this innovative tiotropium inhaler could help to maximize patient adherence. Pediatric asthma is a chronic disease leading to significant morbidity and health care utilization. As many as 50% of patients remain uncontrolled despite national and international guidelines designed to improve control. As this review reveals, new add-on therapy options to ICS/LABA are required, particularly for children and adolescents. However, developing such treatments is challenging. There are limitations to the conclusions that we can draw from the data sources used in this review, for example to the paucity of pediatric trials, the smaller sample sizes than in adult trials and the lack of information on LAMAs other than tiotropium in pediatric populations. It is also clearly essential that clinical trial design continues to consider alternative clinical endpoints, such as FEF25–75 and IOS, that are likely to be more suitable for use in clinical trials of pediatric asthma. Tiotropium Respimat® is approved in asthma for adult patients (aged ≥18 years) in Singapore, patients aged ≥15 years in Japan and, most recently, approved for patients aged ≥6 years in the US and EU.27,95 The clinical trials of tiotropium in pediatric asthma summarized in this review support the safety and efficacy of tiotropium in children and adolescents, irrespective of disease severity and phenotype. At present, tiotropium is considered as an option for add-on to ICS/LABA combination. However, data suggest that it could be considered as an alternative to adding a LABA to ICS, and this may prove an attractive option for future therapeutic strategies. Editorial support (writing assistance, assembling tables and figures, collating author comments, grammatical editing and referencing) was provided by Wemimo Omotosho, PhD (MediTech Media, London, UK) and was funded by Boehringer Ingelheim. The author would like to thank Kjeld Hansen, a member of the Patient Ambassador Group for the European Lung Foundation, for his input to the video summary for this manuscript. Centres for Disease Control and Prevention. National Health Interview Survey, US children. 2015. Available from: https://ftp.cdc.gov/pub/Health_Statistics/NCHS/NHIS/SHS/2015_SHS_Table_C-1.pdf. Accessed August 31, 2017. Asthma UK. Asthma facts and statistics. 2017. Available from: https://www.asthma.org.uk/about/media/facts-and-statistics/. Accessed August 26, 2017. Asher MI, Keil U, Anderson HR, et al. International Study of Asthma and Allergies in Childhood (ISAAC): rationale and methods. Eur Respir J. 1995;8(3):483–491. Ellwood P, Asher MI, Beasley R, Clayton TO, Stewart AW; ISAAC Steering Committee. The international study of asthma and allergies in childhood (ISAAC): phase three rationale and methods. Int J Tuberc Lung Dis. 2005;9(1):10–16. Mallol J, Crane J, von Mutius E, Odhiambo J, Keil U, Stewart A; ISAAC Phase Three Study Group. The International Study of Asthma and Allergies in Childhood (ISAAC) Phase Three: a global synthesis. Allergol Immunopathol (Madr). 2013;41(2):73–85. Asher I, Pearce N. Global burden of asthma among children. Int J Tuberc Lung Dis. 2014;18:1269–1278. The Global Asthma Network. The Global Asthma Report 2014. Available from: http://www.globalasthmareport.org/resources/Global_Asthma_Report_2014.pdf. Accessed August 26, 2017. Murray CJ, Vos T, Lozano R, et al. Disability-adjusted life years (DALYs) for 291 diseases and injuries in 21 regions, 1990–2010: a systematic analysis for the Global Burden of Disease Study 2010. Lancet. 2012;380(9859):2197–2223. Schmier JK, Manjunath R, Halpern MT, Jones ML, Thompson K, Diette GB. The impact of inadequately controlled asthma in urban children on quality of life and productivity. Ann Allergy Asthma Immunol. 2007;98(3):245–251. Murray CS, Poletti G, Kebadze T, et al. Study of modifiable risk factors for asthma exacerbations: virus infection and allergen exposure increase the risk of asthma hospital admissions in children. Thorax. 2006;61(15):376–382. Guttmann A, Zagorski B, Austin PC, et al. Effectiveness of emergency department asthma management strategies on return visits in children: a population-based study. Pediatrics. 2007;120(6):e1402–e1410. Pedersen SE, Hurd SS, Lemanske RF Jr, et al; Global Initiative for Asthma. Global strategy for the diagnosis and management of asthma in children 5 years and younger. Pediatr Pulmonol. 2011;46(1):1–17. Global Initiative for Asthma. GINA Report, Global strategy for asthma management and prevention. 2018. Available from: http://ginasthma.org/2018-gina-report-global-strategy-for-asthma-management-and-prevention/. Accessed March 25, 2018. Price D, Fromer L, Kaplan A, van der Molen T, Román-Rodríguez M. Is there a rationale and role for long-acting anticholinergic bronchodilators in asthma? NPJ Prim Care Respir Med. 2014;24:14023. McIvor ER, McIvor RA. The evolving role of tiotropium in asthma. J Asthma Allergy. 2017;10:231–236. Philip J. The effects of inhaled corticosteroids on growth in children. Open Respir Med J. 2014;8:66–73. Barnes PJ. Neural mechanisms in asthma. Br Med Bull. 1992;48(1):149–168. Qureshi F, Zaritsky A, Lakkis H. Efficacy of nebulized ipratropium in severely asthmatic children. Ann Emerg Med. 1997;29(2):205–211. Griffiths B, Ducharme FM. Combined inhaled anticholinergics and short-acting beta2-agonists for initial treatment of acute asthma in children. Cochrane Database Syst Rev. 2013;(8):CD000060. Schuh S, Johnson DW, Callahan S, Canny G, Levison H. Efficacy of frequent nebulized ipratropium bromide added to frequent high-dose albuterol therapy in severe childhood asthma. J Pediatr. 1995;126(4):639–645. Zorc JJ, Pusic MV, Ogborn CJ, Lebet R, Duggan AK. Ipratropium bromide added to asthma treatment in the pediatric emergency department. Pediatrics. 1999;103(4 Pt 1):748–752. Teoh L, Cates CJ, Hurwitz M, Acworth JP, van Asperen P, Chang AB. Anticholinergic therapy for acute asthma in children. Cochrane Database Syst Rev. 2012;(4):CD003797. Barnes PJ. Muscarinic receptor subtypes in airways. Eur Respir J. 1993;6:328–331. Gosens R, Zaagsma J, Meurs H, Halayko AJ. Muscarinic receptor signaling in the pathophysiology of asthma and COPD. Respir Res. 2006;7:73. Busse WW, Dahl R, Jenkins C, Cruz AA. Long-acting muscarinic antagonists: a potential add-on therapy in the treatment of asthma? Eur Respir Rev. 2016;25(139):54–64. Belmonte KE. Cholinergic pathways in the lungs and anticholinergic therapy for chronic obstructive pulmonary disease. Proc Am Thorac Soc. 2005;2(4):297–304; discussion 311–312. Aalbers R, Park HS. Positioning of long-acting muscarinic antagonists in the management of asthma. Allergy Asthma Immunol Res. 2017;9(5):386–393. Barnes PJ. The pharmacological properties of tiotropium. Chest. 2000;117(2 Suppl):63S–66S. Kerstjens HA, Engel M, Dahl R, et al. Tiotropium in asthma poorly controlled with standard combination therapy. N Engl J Med. 2012;367(13):1198–1207. Kerstjens HA, Casale TB, Bleecker ER, et al. Tiotropium or salmeterol as add-on therapy to inhaled corticosteroids for patients with moderate symptomatic asthma: two replicate, double-blind, placebo-controlled, parallel-group, active-comparator, randomised trials. Lancet Respir Med. 2015;3(5):367–376. Ohta K, Ichinose M, Tohda Y, et al. Long-term once-daily tiotropium Respimat® is well tolerated and maintains efficacy over 52 weeks in patients with symptomatic asthma in Japan: a randomised, placebo-controlled study. PLoS One. 2015;10(4):e0124109. Paggiaro P, Halpin DM, Buhl R, et al. The effect of tiotropium in symptomatic asthma despite low- to medium-dose inhaled corticosteroids: a randomized controlled trial. J Allergy Clin Immunol Pract. 2016;4(1):104.e2–113.e2. Raissy HH, Kelly HW. Tiotropium bromide in children and adolescents with asthma. Paediatr Drugs. 2017;19(6):533–538. Vogelberg C, Engel M, Moroni-Zentgraf P, et al. Tiotropium in asthmatic adolescents symptomatic despite inhaled corticosteroids: a randomised dose-ranging study. Respir Med. 2014;108(9):1268–1276. Vogelberg C, Moroni-Zentgraf P, Leonaviciute-Klimantaviciene M, et al. A randomised dose-ranging study of tiotropium Respimat® in children with symptomatic asthma despite inhaled corticosteroids. Respir Res. 2015;16:20. Hamelmann E, Vogelberg C, Voelker B, et al. Tiotropium add-on therapy improves lung function in children and adolescents with moderate and severe symptomatic asthma, independent of markers of allergic status. Allergy. 2017;72:S103:413. Hamelmann E, Bateman ED, Vogelberg C, et al. Tiotropium add-on therapy in adolescents with moderate asthma: a 1-year randomized controlled trial. J Allergy Clin Immunol. 2016;138(2):441–450. Vogelberg C, Engel M, Laki I, et al. Tiotropium add-on therapy improves lung function in children with symptomatic moderate asthma. J Allergy Clin Immunol Pract. 2018;6(6):2160–2162.e9. Szefler SJ, Murphy K, Harper T 3rd, et al. A phase III randomized controlled trial of tiotropium add-on therapy in children with severe symptomatic asthma. J Allergy Clin Immunol. 2017;140(5):1277–1287. Bisgaard H, Vandewalker M, Graham LM, et al. Safety of tiotropium in pre-school children with symptomatic persistent asthma. Eur Respir J. 2016;48(Suppl 60):PA315. Hamelmann E, Bernstein JA, Vandewalker M, et al. A randomised controlled trial of tiotropium in adolescents with severe symptomatic asthma. Eur Respir J. 2017;49(1). pii: 1601100. Vogelberg C, Engel M, Laki I, et al. Tiotropium add-on therapy improves lung function in children with symptomatic moderate asthma. J Allergy Clin Immunol Pract. In Press 2018. Vrijlandt EJLE, El Azzi G, Vandewalker M, et al. Safety and efficacy of tiotropium in children aged 1–5 years with persistent asthmatic symptoms: a randomised, double-blind, placebo-controlled trial. Lancet Respir Med. 2018;6(2):127–137. Vogelberg C, Hamelmann E, Szefler S, et al. Once-daily tiotropium respimat add-on therapy improves lung function and control in adolescents and children with moderate symptomatic asthma. J Allergy Clin Immunol. 2017;139(2):AB95. Rodrigo GJ, Neffen H. Efficacy and safety of tiotropium in school-age children with moderate–to-severe symptomatic asthma: a systematic review. Pediatr Allergy Immunol. 2017;28(6):573–578. Schatz M, Rosenwasser L. The allergic asthma phenotype. J Allergy Clin Immunol Pract. 2014;2(6):645–648; quiz 649. Holgate ST, Bousquet J, Chung KF, et al; Group for the Respect of Ethics and Excellence in Science: Asthma section. Summary of recommendations for the design of clinical trials and the registration of drugs used in the treatment of asthma. Respir Med. 2004;98(6):479–487. Vandewalker M, Vogelberg C, Hamelmann E, et al. Tiotropium Respimat® add-on therapy improves lung function in adolescents and children with moderate symptomatic asthma, irrespective of IgE levels and eosinophil count. Poster P521 presented at: the American Thoracic Society International Conference; May 19–24; 2016; Washington, DC. Goldstein S, Vogelberg C, Hamelmann E, et al. Tiotropium Respimat® add-on therapy is effective in children and adolescents with severe symptomatic asthma, irrespective of immunoglobulin E levels and eosinophil count. Poster P520 presented at: the American Thoracic Society International Conference; May 19–24; 2016; Washington, DC. Beeh KM, Kirsten AM, Dusser D, et al. Pharmacodynamics and pharmacokinetics following once-daily and twice-daily dosing of tiotropium Respimat® in asthma using standardized sample-contamination avoidance. J Aerosol Med Pulm Drug Deliv. 2016;29(5):406–415. Sharma A, Kerstjens HA, Aalbers R, Moroni-Zentgraf P, Weber B, Dahl R. Pharmacokinetics of tiotropium administered by Respimat((R)) in asthma patients: analysis of pooled data from Phase II and III clinical trials. Pulm Pharmacol Ther. 2017;42:25–32. Sharma A, Weise S, Szefler S. Pharmacokinetics of tiotropium in patients aged 6–11 years with moderate asthma following administration via the Respimat® inhaler. In: abstract presented at EAACI PAAM. Eur Acad Allergy Clin Immunol Cong; October 26–28, 2017; London, UK. Sharma A, Aalbers R, Hamelmann E, et al. Pharmacokinetics of tiotropium administered by Respimat® in adolescent asthma patients. Eur Resp J. 2017;50:S61:PA585. US Food and Drug Administration. Tiotropium bromide clinical pharmacology review. 2016. Available from: https://www.fda.gov/downloads/drugs/developmentapprovalprocess/developmentresources/ucm549091.pdf. Accessed August 30, 2017. Boehringer Ingelheim Limited. Spiriva Respimat 2.5 microgram, inhalation solution – Summary of Product Characteristics; 2017. Park HW, Yang MS, Park CS, et al. Additive role of tiotropium in severe asthmatics and Arg16Gly in ADRB2 as a potential marker to predict response. Allergy. 2009;64(5):778–783. GlaxoSmithKline. A phase III parallel group study, comparing the efficacy, safety and tolerability of the fixed dose combination (FDC) of fluticasone furoate+umeclidinium bromide+vilanterol (FF/UMEC/VI) with the FDC of FF/VI in subjects with inadequately controlled asthma. Available from: https://clinicaltrials.gov/ct2/show/NCT02924688. NLM identifier: NCT02924688. Accessed August 30, 2017. Yang S, Goyal N, Beerahee M, Trivedi R, Lee L, Pascoe S. Dose-response modelling of umeclidinium and fluticasone furoate/umeclidinium in asthma. Eur J Clin Pharmacol. 2015;71(9):1051–1058. Lee LA, Yang S, Kerwin E, Trivedi R, Edwards LD, Pascoe S. The effect of fluticasone furoate/umeclidinium in adult patients with asthma: a randomized, dose-ranging study. Respir Med. 2015;109(1):54–62. Pearl Therapeutics, Inc. Chronic dosing cross-over study to assess the efficacy and safety of glycopyrronium (PT001) in adult subjects with intermittent asthma or mild to moderate persistent asthma. Available from: https://clinicaltrials.gov/ct2/show/results/NCT02433834. NLM identifier: NCT02433834. Accessed August 30, 2017. Chiesi Farmaceutici S.p.A.. Efficacy of LAMA added to ICS in treatment of asthma (ELITRA). Available from: https://clinicaltrials.gov/ct2/show/NCT02296411. NLM identifier: NCT02296411. Accessed August 30, 2017. Blais CM, Davis BE, Cockcroft DW. Duration of bronchoprotection of the long-acting muscarinic antagonists tiotropium & glycopyrronium against methacholine-induced bronchoconstriction in mild asthmatics. Respir Med. 2016;118:96–101. University of Saskatchewan. Effect of a LAMA and a uLABA on the methacholine dose-response curve. Available from: https://clinicaltrials.gov/ct2/show/NCT02953041. NLM identifier: NCT02953041. Accessed August 30, 2017. Salmon M, Luttmann MA, Foley JJ, et al. Pharmacological characterization of GSK573719 (umeclidinium): a novel, long-acting, inhaled antagonist of the muscarinic cholinergic receptors for treatment of pulmonary diseases. J Pharmacol Exp Ther. 2013;345(2):260–270. Lee LA, Briggs A, Edwards LD, Yang S, Pascoe S. A randomized, three-period crossover study of umeclidinium as monotherapy in adult patients with asthma. Respir Med. 2015;109(1):63–73. Alagha K, Palot A, Sofalvi T, et al. Long-acting muscarinic receptor antagonists for the treatment of chronic airway diseases. Ther Adv Chronic Dis. 2014;5(2):85–98. Busse WW, Morgan WJ, Taggart V, Togias A. Asthma outcomes workshop: overview. J Allergy Clin Immunol. 2012;129(3 Suppl):S1–S8. Spahn J. Clinical trial efficacy: what does it really tell you? J Allergy Clin Immunol. 2003;112(5 Suppl):S102–S106. Ståhl E. Correlation between objective measures of airway calibre and clinical symptoms in asthma: a systematic review of clinical studies. Respir Med. 2000;94(8):735–741. Yawn BP, Brenneman SK, Allen-Ramey FC, Cabana MD, Markson LE. Assessment of asthma severity and asthma control in children. Pediatrics. 2006;118(1):322–329. Crenesse D, Berlioz M, Bourrier T, Albertini M. Spirometry in children aged 3 to 5 years: reliability of forced expiratory maneuvers. Pediatr Pulmonol. 2001;32(1):56–61. Fonseca AC, Fonseca MT, Rodrigues ME, Lasmar LM, Camargos PA. Peak expiratory flow monitoring in asthmatic children. J Pediatr (Rio J). 2006;82(6):465–469. Self TH, George CM, Wallace JL, Patterson SJ, Finch CK. Incorrect use of peak flow meters: are you observing your patients? J Asthma. 2014;51(6):566–572. Szefler SJ, Chmiel JF, Fitzpatrick AM, et al. Asthma across the ages: knowledge gaps in childhood asthma. J Allergy Clin Immunol. 2014;133(1):3–13; quiz 14. O’Brian AL, Lemanske RF Jr, Evans MD, Gangnon RE, Gern JE, Jackson DJ. Recurrent severe exacerbations in early life and reduced lung function at school age. J Allergy Clin Immunol. 2012;129(4):1162–1164. O’Byrne PM, Pedersen S, Lamm CJ, Tan WC, Busse WW; START Investigators Group. Severe exacerbations and decline in lung function in asthma. Am J Respir Crit Care Med. 2009;179(1):19–24. Cabana MD, Kunselman SJ, Nyenhuis SM, Wechsler ME. Researching asthma across the ages: insights from the National Heart, Lung, and Blood Institute’s Asthma Network. J Allergy Clin Immunol. 2014;133(1):27–33. Fuhlbrigge A, Peden D, Apter AJ, et al. Asthma outcomes: exacerbations. J Allergy Clin Immunol. 2012;129(3 Suppl):S34–S48. Caldwell PH, Murphy SB, Butow PN, Craig JC. Clinical trials in children. Lancet. 2004;364(9436):803–811. Cloutier MM, Schatz M, Castro M, et al. Asthma outcomes: composite scores of asthma control. J Allergy Clin Immunol. 2012;129(3 Suppl):S24–S33. Bacharier LB, Guilbert TW. Diagnosis and management of early asthma in preschool-aged children. J Allergy Clin Immunol. 2012;130(2):287–296; quiz 297–298. Murphy KR, Zeiger RS, Kosinski M, et al. Test for respiratory and asthma control in kids (TRACK): a caregiver-completed questionnaire for preschool-aged children. J Allergy Clin Immunol. 2009;123(4):833.e9–839.e9. Lipworth B. Targeting the small airways asthma phenotype: if we can reach it, should we treat it? Ann Allergy Asthma Immunol. 2013;110(4):233–239. Ciprandi G, Cirillo I, Pasotti F, Ricciardolo FL. FEF25-75: a marker for small airways and asthma control. Ann Allergy Asthma Immunol. 2013;111(3):233. Gibb E, Kaplan D, Thyne SM, Ly NP. Fef 25-75 as a predictor of asthma severity in children. Paper presented at: American Thoracic Society International Conference; May 21; 2012; San Francisco, CA. Quanjer PH, Weiner DJ, Pretto JJ, Brazzale DJ, Boros PW. Measurement of FEF25–75% and FEF75% does not contribute to clinical decision making. Eur Respir J. 2014;43(4):1051–1058. Komarow HD, Myles IA, Uzzaman A, Metcalfe DD. Impulse oscillometry in the evaluation of diseases of the airways in children. Ann Allergy Asthma Immunol. 2011;106(3):191–199. Larsen GL, Morgan W, Heldt GP, et al; Childhood Asthma Research and Education Network of the National Heart, Lung, and Blood Institute. Impulse oscillometry versus spirometry in a long-term study of controller therapy for pediatric asthma. J Allergy Clin Immunol. 2009;123(4):861.e1–867.e1. James A, Hedlin G. Biomarkers for the phenotyping and monitoring of asthma in children. Curr Treat Options Allergy. 2016;3(4):439–452. McQuaid EL, Kopel SJ, Klein RB, Fritz GK. Medication adherence in pediatric asthma: reasoning, responsibility, and behavior. J Pediatr Psychol. 2003;28(5):323–333. Palo Alto Medical Foundation. Inhaled medications: anticholinergics. 2015. Available from: http://www.pamf.org/asthma/medications/inhaled/atrovent.html. Accessed August 30, 2017. Dalby RN, Eicher J, Zierenberg B. Development of Respimat(®) Soft Mist™ Inhaler and its clinical utility in respiratory disorders. Med Devices (Auckl). 2011;4:145–155. Wachtel H, Kattenbeck S, Dunne S. The Respimat® development story: Patient-centered innovation. Pulm Ther. 2017;3(1):19–30. Hodder R, Reese PR, Slaton T. Asthma patients prefer Respimat Soft Mist Inhaler to Turbuhaler. Int J Chron Obstruct Pulmon Dis. 2009;4:225–232. Boehringer Ingelheim. Asthma: Expanded indication for SPIRIVA Respimat for people 6 years and older. Available at: https://www.boehringer-ingelheim.com/press-release/expanded-asthma-indication-spiriva-respimat-eu. Accessed May 24, 2018.